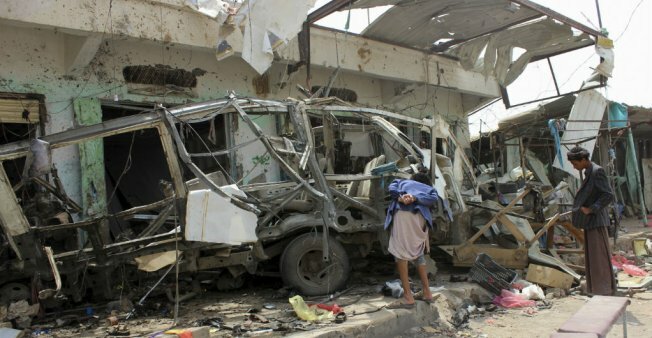 Yemenis gather next to the destroyed bus at the site of a Saudi-led coalition air strike, that targeted the Dahyan market the previous day in the Houthi rebels’ stronghold province of Saada on August 10, 2018. Credit: Stringer, AFP. On Monday, Saudi Arabia suspended economic ties with Canada in response to a tweet from Canada’s foreign ministry criticizing the kingdom’s treatment of human rights activists. The kingdom has frozen new trade and investment with Canada, suspended flights to Toronto, put its educational exchange programs with Canada on hold, and discontinued sending Saudi patients to Canadian hospitals with plans to move students and patients already in Canada to other countries. On hose already there to another country.suspended flights to Toronto, put its educational exchange programs with Canada on hold, and said it would cease sending Saudi patients to Canadian hospitals in a diplomatic row that has only and plans to move those already there to another country. The previous Friday, Canada said it was “gravely concerned” about the arrests of civil society and women’s rights activists in Saudi Arabia, and urged the “Saudi authorities to immediately release them and all other peaceful human rights activists” on the Global Affairs Canada Twitter feed. A statement from the Saudi Press Agency confirmed the Saudi government’s commitment to refraining from intervening in the internal matters of other countries, including Canada, and in rejected any intervention in its domestic affairs and internal relations with its citizens. Also on Monday, Newsweek reported that White House senior advisor and President Trump son-in-law, Jared Kushner, has been trying to abolish the United Nations aid agency that provides humanitarian relief to millions of Palestinian refugees. Internal emails obtained by Foreign Policy indicate that Kushner discussed eradicating the United Nations Relief and Works Agency for Palestine Refugees in the Near East (UNRWA) — created in 1949 to provide food and educational, medical and social services to Palestinians who were displaced following the establishment of the state of Israel — with other senior officials. “It is important to have an honest and sincere effort to disrupt UNRWA,” Kushner wrote in an email sent on January 11 to multiple senior officials. “This [agency] perpetuates a status quo, is corrupt, inefficient and doesn’t help peace.” On January 16, just days after Kushner sent the email about disrupting the UNRWA, the U.S. cut about half of its funding to the agency, announcing it would withhold $65 million of the $125 million earmarked for aid. On Tuesday, the U.S. reimposed a round of sanctions against Iran, a move the Trump administration hopes will further damage the Iranian economy and force concessions from Tehran on a number of fronts. The sanctions, which were previously lifted under the 2015 nuclear deal, severely limit Iran’s ability to buy U.S. currency and issue sovereign debt, and also place restrictions on trade with Iran in aluminum and steel, and the automotive and airline industries. In addition, the sanctions will affect Iran’s ability to export goods like pistachios and its famous Persian rugs. The most significant impact of the sanctions may be the number of European companies that will stop doing business with Iran. A second round of sanctions is planned for November and will further strain Iran’s economy by targeting its oil sector and central bank. On Wednesday, BBC published a story on sheep traders in Algeria who are using Facebook and a local online selling site to sell their livestock ahead of the Islamic Eid al-Adha festival. They are hopeful that e-commerce can spare them the risks that come with travelling to big cities to sell their sacrificial animals, given that traders have previously been beaten and had their sheep stolen, Echourouk news website reports. 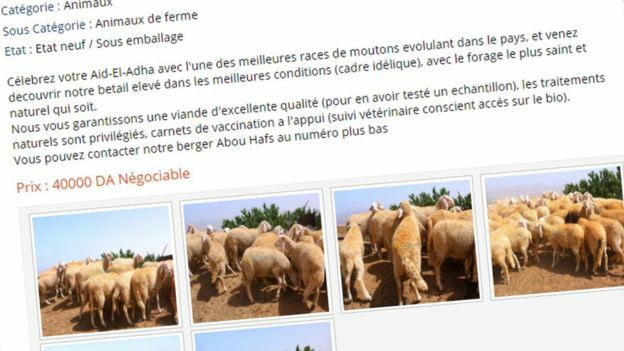 Facebook and Ouedkniss.com, an Algerian classified ad site, offer traders platforms to post pictures of their livestock from the comfort of their homes. An ad posted on Ouedkniss on 7 August showed pictures of rams of “a global renown” which were for sale at “an excellent price.” Eid al-Adha will start on the evening of August 21st; it is the 2nd most important festival in the Muslim calendar. In honor of the occasion when Allah (God) appeared to Ibrahim (Abraham) in a dream and asked him to sacrifice his son Ismail as an act of obedience, the festival includes the sacrifice of a sheep whose meat is shared with friends, family and the poor. The holiday takes place at the conclusion of the Haj pilgrimage to Mecca, one of the five pillars of Islam. Terrorist attacks in the Middle East and North Africa fell by almost 40% last year reported website Quartz. The numbers, from the Global Terrorism Database, a compilation of attacks published yearly by the University of Maryland, show that the steepest drops were in Iraq, Turkey (due to fewer strikes by Kurdish rebels), Libya, Yemen (where incidents fell despite the civil war), and Syria. The near-complete defeat of primary faction of the Islamic State in Iraq and Syria is one explanation for the decrease. Its local factions, operating in countries like Libya and Egypt, also had less impact. Overall, attacks around the world went from about 17,000 three years ago to about 11,000 last year; however, terrorism is still widespread in Asia, the Middle East, and Africa — nine in every 10 attacks in 2017 took place in those regions. An airstrike in Yemen on Thursday killed dozens of children traveling on a bus on a field trip. The strike came from the Saudi Arabia-led coalition in the war against the Houthi rebels, who are viewed as proxies for Iran. The Red Cross has said that 40 of the 51 people killed in the attack in the western Saada province were boys aged 6 to 11. The coalition initially called the strike on the bus a “legitimate military action” in response to a rebel missile attack on the Saudi city of Jizan on Wednesday, but as photographs of dazed and bloodied children flooding into hospitals were beamed around the world, it was forced to concede to an investigation. Western governments have condemned the civilian deaths, but they remain political and military backers of Saudi Arabia, which is a regional ally and spends billions of dollars on arms from the United States, Britain and France.